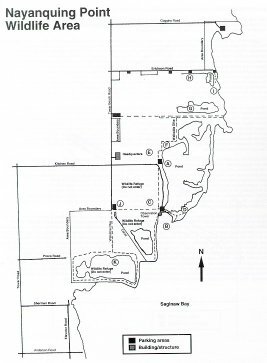 Nayanquing Point Wildlife Area is one of the most visited areas in Saginaw Bay for water birds. It is also home to one of the oldest and largest colonies of Yellow-headed Blackbirds in the state. In the spring and fall, Nayanquing is home to huge numbers of migrating waterfowl and smaller numbers of gulls and shorebirds. Such finds as Trumpeter Swan (banded bird from Minnesota population), Greater White-fronted Goose, Cinnamon Teal, Arctic Tern, Little, Franklin's, Laughing, and Lesser Black-backed Gulls and Long-tailed Jaeger have been noted in recent years. Many waterfowl are seen in the summer months as this area also hosts a wide variety of nesting ducks. Species such as Green-winged Teal, American Black Duck, Northern Pintail, Northern Shoveler, Gadwall, American Wigeon, and Redhead are noted here in small numbers each summer. Some of the more interesting residents include Pied-billed Grebe, Black-crowned Night-Heron, American and Least Bitterns, Common Moorhen, Ring-necked Pheasant, Black and Forster's Terns, Marsh and Sedge Wrens, and Willow Flycatcher. While you are visiting, be sure to visit the Nayanquing Headquarters on Tower Beach Road, where you can pick up more information about the Point! Take I-75 to either the Pinconning exit (from the north) or the Linwood exit (from the south) and heading east to M-13. Signs for the wildlife area are found at the intersection of M-13 and Kitchen Road, three miles north of Linwood Road. Follow Kitchen Road east to Nayanquing Point.